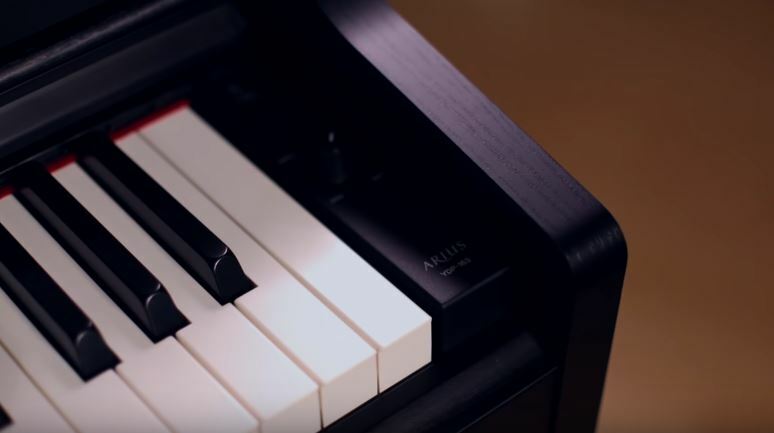 Yamaha Arius YDP-163 Review: As we know, Yamaha is one of the biggest brand in digital keyboard market and due to their top notch product quality Yamaha has maintained the top positions even in this highly competitive music industry. And surely Yamaha Arius YDP 163 simply reflects what Yamaha is known for “The Top Notch Musical Instruments”. I personally used it for more than a week and my experience was awesome. Yamaha Engineers had put some great effort while designing YDP 163. It offers flawless controls and features that are only available on high end keyboards. So without further ado lets see what YDP 163 has to offers to us. Features Of Yamaha YDP 163 Digital Piano. Yamaha YDP 163 is not a portable keyboard like others so it can be categorized under console digital pianos. The reason I am saying it as a console piano is because it is built on a beautiful furniture style stand with beautiful wood grain finish. In short, the look is simply awesome and complement your beautiful house. It also has a sliding key cover and a three pedal board which will surely help in getting a better grip on your song. YDP 163 is the successor to the incredibly popular Arius YDP-162 and there are many new exciting features in the YDP-163 that the earlier version lacks. As with all the digital pianos, the most important two things are touch and tone of the keyboard and Yamaha Arius YDP-163 simply nails it. Yamaha YDP 163 has a pure CF sampling sound. The sampling is done with legendary, iconic nine-foot CF 3S concert grand. And all these samples goes into making the beautiful acoustic piano samples that YSD 163 offers to us. The YDP-163 also has GH3 88-key piano with graded hammer action keys with three different sensors. So, this is an incredible replica of an acoustic grand piano action (not to be confused with upright piano action) . The difference between grand piano action and an upright action is that on an upright piano action the hammer is on upward position and when you press the key to strike a note than you have to let the key come all the way back up before you can restrike again. But on a grand piano the hammers are on vertical position so when you press the key you don’t have to let it come all the way up before you can restrike the keys. SO, what’s the point? Why grand piano action key is better ? 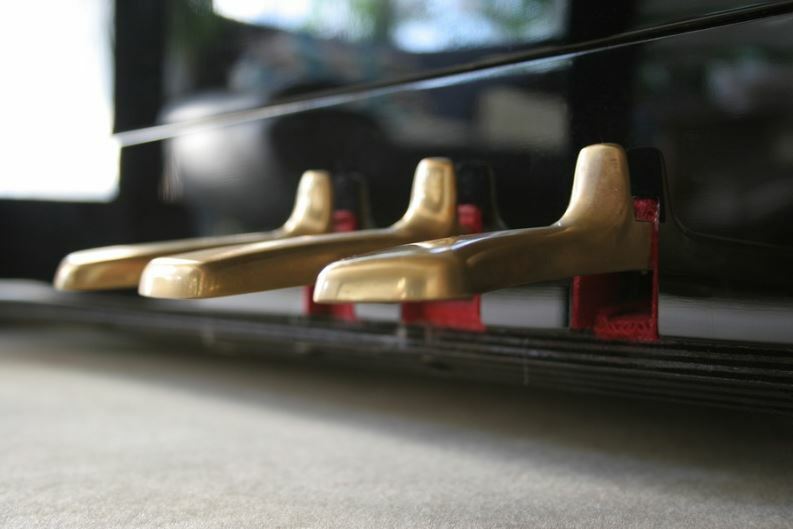 It is because it allows for faster key repetition and simulates the authentic feel of an real grand piano. This is why most musicians prefers to play on a grand piano action keyboard. When it comes to the combination of the pure CF sampling sound and GH3 graded action, you get an incredible piano playing experience. 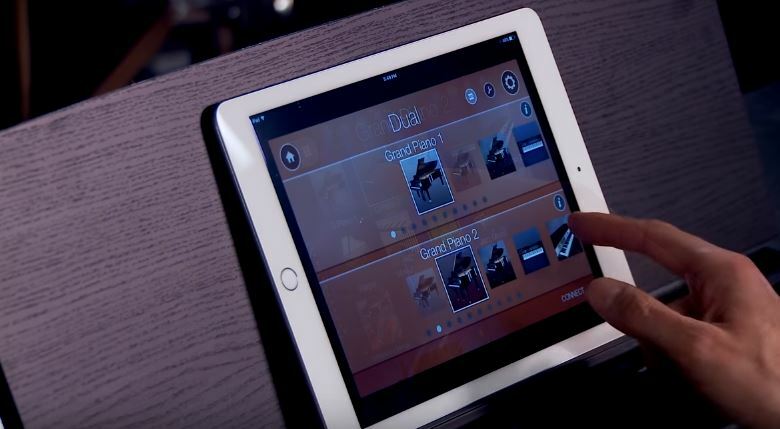 For the first time ever, the YDP-163 and YDP 162 can also be utilized by the digital piano controller app. This app turns you iOS/Android device into a graphical user interface to access the functionality of the keyboard. The app also allows you to select voices, layers, transpose and can also control reverb level and much more things. When it comes to connectivity option YDP 163 takes the easy usability to a whole new level. You can either the connect the keyboard with a USB cable, adapter or the optional Yamaha wireless Bluetooth adapter UD-BT01. Do you know what is polyphony? In simple word we can say that Polyphony is the amount of notes that can be sustained simultaneously. The YDP-163 piano has 192 polyphony. The huge polyphony number reflects an acoustic piano because there is no polyphony limitation on acoustic pianos. The 192 polyphony simply opens a whole new dimension and allows you to play even the most complex passages without fears of note dropping out. In most of the digital pianos, the damper pedal is merely are on only ON/Off state. But the YDP-163 offers half dampening, so you can do more complex pedaling which is available only found on real acoustic pianos. In addition, Yamaha YDP 163 also features damper resonance. Damper resonance mimics the behavior of an acoustic pianos like the way the strings sympathetically resonate with each other while you are using the damper pedal. These minor but effective features increases the overall feel of the keyboard and makes YDP 163 a good option to consider for a long run. Another cool feature which I personally liked is the built in 50 iconic and legendary classic songs. You can either listen to them for pure enjoyment or you can play along with the included 50 great piano sound book. The YDP-163 also includes some standard Yamaha digital piano features such as 10 different voices, duo mode (perfect for teaching students), track song recorder etc. The inbuilt host part allows you to connect your UDP 163 directly to a computer without installing any extra drivers for the instrument. 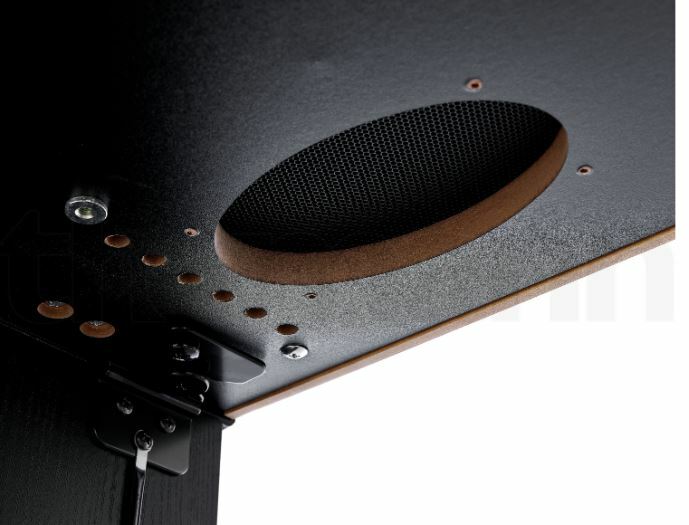 YDP-163 has a high-definition 40 watt (20 * 2 watt) speaker system. The sound is simply crispy and crystal clear. It also has 2 independent headphone jacks (when you plug the headphone the onboard speaker gets disable) so up to two peoples at a time can have their own private listening experience. "Check This Superb Sound and Overview Of Yamaha YDP 163"
As I said earlier I really enjoyed the keyboard while playing. It looks looks quite majestic and enhance the beauty of your house too. The on-board speakers sounds are loud and clear. But in my experience after increasing the volume over 80% the speaker starts making fizzy kind of sound. I am not sure about that, this issue is occured only on my keyboard or is it is a fault with the entire line. The touch sensitive keys works perfectly as it supposed to be. Yamaha YDP 163 price is also genuine and perfect for mid range budget piano. The best part I liked is that you never have to tune it. Which is amazing and saves you from a lot of headaches and $$$ too. The alternate option for YDP 163 can be Yamaha CP 4 and P 125. So you check them too before finalizing your purchase. That's all from our end hope our review of Yamaha YDP 163 helped you in making a better decision to which keyboard to opt for.